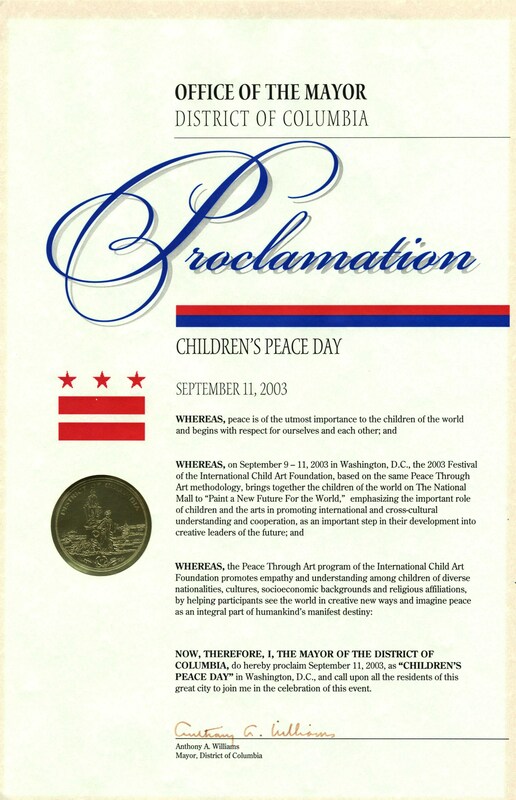 The ICAF's key objectives are to cultivate children's imagination, reduce violence, and remediate suffering. The ICAF fosters children's creativity and develops their empathy. As a world leader in children's art, the ICAF arranges exhibitions in Washington, D.C., at major events across the U.S., and around the world. The ICAF has also been invited to organize youth and children's panels at significant conferences. Adults gain the opportunity to become acquainted with the imagination that will shape our future. The world's largest art program for schoolchildren. The premier publication for child creative development and education through the arts. The "Olympics" of children's imagination on The National Mall for three days in July 2020, free and open to the public. The world leader in children's art exhibitions showcasing the imagination that will shape the future. Restoring the trust in nature of child victims of natural disasters. Restoring the faith in humanity of child victims of manmade conflicts. Children bringing their perspectives on issues concerning the future. Paying a unique tribute to creative leaders of corporations and foundations.